"FREE TV Is Better Than No TV"
No Cable TV, Satellite TV, U-Verse TV Needed, Only Internet. In Conjunction with a TV Antenna for local "Free" Network TV, you'll have it all! Streaming TV refers to watching streaming TV programming, movies and videos from online sources not through an internet box, like the RoKu Box, but on a computer or laptop that can be or is connected to your HDTV. This gives you a full screen TV-Video viewing experience of online content in the large screen format you may prefer. Of course you can always watch online TV on your computer or laptop in the full screen mode at home or when traveling. It's a little hard to watch TV this way so it may not be for everyone at this time but, it is the future of TV. Nowadays many people are choosing online TV for the unlimited and great variety of video content available. There are many sources for online TV, YouTube is the most popular, but there are more little known websites offering some form of video from YouTube style videos to live streaming TV shows, cable channels, local government channels to international TV from around the globe. The quality of the video can range from poor to 720p HD. A plus to this type setup is you will be able to view your computer on your TV when you surf the net. Streaming TV viewing is catching on, but you will need to configure your computer or laptop to view on your TV or HDTV for viewing online TV and this may take some tech skills. This type of TV viewing might not be for everyone, but if you like to be on the cutting edge of technology and adapt easily, you will enjoy Online TV. You may have to Google the net for more detailed instructions and methods of connecting your computer or laptop to your TV. There are even online videos showing how to do it. I will give a brief description below to get you started, then you can expand on it. We can even help you do it when we install your antenna. There are a few methods to get connected to Online TV. First, you need a computer or laptop, the newer and faster, the better. Windows 7 Media Center is great and is now used by many high end home theater configurations. A Mac can also be used. Some of my customers have purchased a low cost computer and added a dual Digital TV card for Over-The-Air viewing through the computer tuner card. Windows 7 Media Center has a TiVo type DVR included for the recording of TV shows. If you have a somewhat fast computer you have stopped using and is just collecting dust, you may want to experiment with it. You need a good video card and make sure your video card driver is up to date. To Connect your computer or laptop to your HDTV, most newer HDTV's have a couple types of inputs for a computer hookup. Some older TV's may have a standard computer monitor VGA DB9 plug and even older desktops or laptops have a yellow video out or s-video that will work. Most all TV's have these inputs. But some HDTV's have a DVI monitor input plug, and most HDTV's now have HDMI inputs. Your computer needs to have the same corresponding output connector. For a laptop with an HDMI connection, (Mac needs an adapter for HDMI) you would place your laptop/Mac next to your TV and with an HDMI cable, (you can purchase low cost 12' or more online if you need a longer cable) plug the HDMI cable into your laptop and the other end into your HDTV's HDMI input. Change your TV's input or source to the HDMI input you are using. If your laptop is on, you should see your laptop on your TV. HDMI carries audio, if you don't hear your laptop's sound on your TV, you may need to change some settings on your computer, such as second monitor in the display settings. Or you may need a second cable for audio to connect your laptop's audio out to your sound system if your using a VGA cable. With a desktop computer you may have to get a DVI to HDMI converter plug or a converter plug for the setup you choose. After you get picture and sound from your desktop or laptop on your HDTV, you will be ready to watch online TV on your full size HDTV. There arewireless remotes available for your computer/laptop to regain remote control. Start Watching online TV-Video on your HDTV full screen the way you like. Simply go to the website for the videos you want, you can go directly to the TV Network or Cable Channel website to view available videos or shows. Let's say you missed the nightly NBC news, go to http://www.msnbc.msn.com to view that day's news that aired earlier on TV or view on a RoKu box. Like HGTV or ESPN, go to their websites and view available content and shows. At the bottom of each video there is usually a Full Screen button to click to expand the video to full screen instead of the smaller inset video. Click, "Esc" to exit full screen mode. You may want to try Boxee TV on your computer/laptop it is a FREE download program at, (www.boxee.tv). After you install it, you will have access to stream thousands of TV shows and TV series to your computer/laptop and to your HDTV. You can get back many of the popular live Cable/satellite channels by streaming to your computer or TV via computer or laptop for occasional viewing. A little work but fun to play around with when you want to view live cable again. To kill the ads. Plus you'll like it for your regular browsing! If a link doesn't work when clicked on, copy and past the link into your browsers address bar to go to the link. 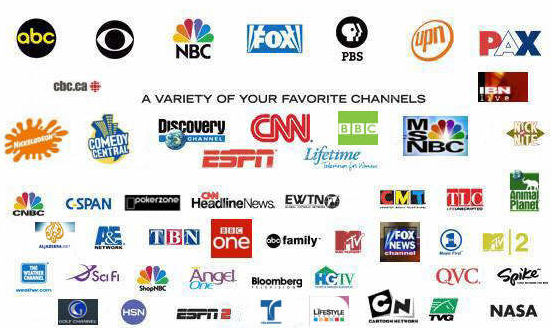 The Roku Box has Over 700 Channels, Click to See Them All....Wow! Many people are using a Roku Box for internet TV, NetFlix and tons of programming and movies, even Free movie channels, YouTube and many more channels http://www.roku.com/ they are not expensive. It connects to your TV via your wireless broadband connection. If you subscribe to NetFlix streaming ($8 month) then you can view thousands of TV shows and movies. Plus there are over 100 Private Channels on the Roku, Click to See! Online TV Guide's: Know what's on when streaming cable. www.titantv.com enter your zip code choose broadcast (antenna) or a cable or satellite list and created a new list if needed. Know what on when streaming a cable station online. www.wwitv.com look for USA at bottom of countries on the left side for the Free TV channels you see on cable (international and local government channels) Click on your category on the left side after entering the site. Click on the green speed box to view higher number better it plays. Double click for full screen, exc. to resize. If a channel is off line it will be back soon. Play with these on your computer... If more than one stream, find the one that work best. You will need to play around with each site to learn how it works. Click on Channels or Live TV. Don't download any player or player update from pop-ups, close any pop-up ads. Don't forget to switch to full screen Esc back to small screen. Careful what you click on they try to trick you to click on an ad. Your goal is to close as few pop-ups as you can to get to the full screen button. Then that ads are gone... Some sites are free of the popup ads. http://www.playon.tv/ Must check this out for device streaming. Can subscribe. http://www.tvpc.com/ChannelList.php scroll down to United States if one link is down try the second if there are 2 links for the channel. http://www.epctv.com choose the stream that works pause the second if 2.
http://www.hahasport.com Live streaming sporting events. http://www.wimp.com the best of internet video Updated each day. http://tv.blinkx.com/ TV episodes...loaded with many who needs a dvr anymore. www.watchonlinefree.tv Your TV series and episodes NEW ONE! www.TVduck.com Top TV Shows and more. ESPN Live links - navigate the popup ads! Go full screen to avoid pop-ups. www.free-tv-video-online.info Watch all your favorite Tv -shows and movies for free. www.watchmoviez.com Looking for a movie to watch? www.blinkx.com A simple way to discover and share great videos. www.tv.com Your Everything Guide to the New Season, Including Premiere Dates! http://www.wimp.com the best of internet video like U-Tube Updated each day. http://www.seeon.tv/channels Lots of online videos. Don't forget to go to the cable show or TV networks website for old episodes to view. HGTV, Food Network, TV land etc. Stream My TV does not stream videos or host content of any kind, the videos you watch are hosted and shown from online sites. Any videos shown on 3rd party websites have passed their own stringent internal vetting procedures and as such are assumed as fully authorized for publication by the content owners. Stream My TV is not responsible for content of external internet sites. Stream My TV is not responsible for the availability of such third party web sites. The content of such third party web sites is beyond our control. We neither endorse, make any representations nor accept any liability (whether direct or indirect) for such third party web sites or their content, products or services offered at those web sites, or by their sponsoring companies.